Kyrie Andrew Irving (/ˈkaɪri/; born March 23, 1992) is an American professional basketball player for the Boston Celtics of the National Basketball Association (NBA). He was named NBA Rookie of the Year after being selected by the Cleveland Cavaliers with the first overall pick in the 2011 NBA draft. A six-time NBA All-Star, Irving was selected to the All-NBA Third Team in 2015. He won an NBA championship with the Cavaliers in 2016. Irving played college basketball for the Duke Blue Devils before joining the Cavaliers in 2011. He was named the NBA All-Star Game Most Valuable Player (MVP) in 2014. In the 2016 NBA Finals, he made a three-point field goal with 53 seconds remaining in a tied Game 7 to help lead the Cavaliers to a championship over the Golden State Warriors. After losing a rematch against the Warriors in the 2017 Finals, Irving requested a trade, and was traded to the Boston Celtics. He has also played for the United States national team, with which he won gold at the 2014 FIBA Basketball World Cup and the 2016 Summer Olympics. In 2018, he starred in the film Uncle Drew. Irving was born on March 23, 1992 in Melbourne, Australia, to American parents. He is the son of Drederick and Elizabeth Irving, and the stepson of Shetellia Irving. He has an older sister, Asia, and a younger sister, London. His father, Drederick, played college basketball at Boston University alongside Shawn Teague and under coach Rick Pitino. After completing his college career, Irving's father moved to Australia to play professionally for the Bulleen Boomers in the SEABL. Irving lived in the Melbourne suburb of Kew before relocating to the United States when he was two years old. He holds dual American and Australian citizenship. His mother, who was half Sioux, died of an illness when he was four, and Drederick raised him with the help of Irving's aunts. Irving grew up in West Orange, New Jersey, where he often went to his father's adult-league games. His inspiration to play in the NBA came after playing at Continental Airlines Arena during a school trip in fourth grade, when he said, "I will play in the NBA, I promise." As a result of his father's connection to Boston University, Irving spent a lot of time in Boston, including at BU's basketball skills camp. In fifth grade, he was offered a scholarship to Boston University by then-head coach Dennis Wolff. As a teenager, Irving played for the Road Runners of the Amateur Athletic Union (AAU). Irving played for Montclair Kimberley Academy in his freshman and sophomore years in high school. He averaged 26.5 points, 10.3 assists, 4.8 rebounds, and 3.6 steals and became only the school's second 1,000 point scorer. In his sophomore year, he led MKA to its first New Jersey Prep 'B' state title. After that year, he transferred to St. Patrick High School because he felt he needed a bigger challenge. He had to sit out the first 30 days of St. Patrick's season due to the transfer. At St. Patrick, Irving played with Michael Kidd-Gilchrist, who was widely regarded as one of the best players in the class of 2011. In his first season, Irving averaged 17.0 ppg., 5.0 rpg., 6.0 apg. and 2.0 spg, and led the team to its third New Jersey Tournament of Champions title in four years. In August 2009, he led the USA East to the tournament title in the Nike Global Challenge. He was the MVP with 21.3 ppg. and 4.3 apg. The next year, St. Patrick was banned from the state tournament for holding practice prior to the permitted start of the winter sports season. St. Patrick went 24-3 and won the Union County Tournament championship as he finished his senior year with 24.0 ppg, 5.0 rpg. and 7.0 apg. On January 19, 2010, Irving was selected to the 2010 Junior National Select Team. The team played at the 2010 Nike Hoop Summit at the Rose Garden in Portland, Oregon, on April 10. He was also selected to play in the 2010 McDonald's All-American Game and the 2010 Jordan Brand Classic, where he was named co-MVP with Harrison Barnes. In June 2010, Irving was a part of the United States gold medal winning team at the FIBA Americas Under-18 Championship. "2010 Duke Basketball Commitment List". Rivals.com. Archived from the original on February 27, 2017. Retrieved February 27, 2017. "2010 Duke College Basketball Team Recruiting Prospects". Scout.com. Archived from the original on February 27, 2017. Retrieved February 27, 2017. "Duke Blue Devils 2010 Player Commits". ESPN.com. Archived from the original on February 27, 2017. Retrieved February 27, 2017. "Scout.com Team Recruiting Rankings". Scout.com. Retrieved February 27, 2017. "2010 Team Ranking". Rivals.com. Retrieved February 27, 2017. Irving committed to Duke on October 22, 2009, in a television broadcast on ESPNU. Irving played with Duke during the 2010–11 basketball season under the guidance of head coach Mike Krzyzewski. Through the first eight games of the season, he averaged 17.4 points per game on 53.2% shooting, 5.1 assists, 3.8 rebounds and 1.5 steals. Irving was a strong contender for NCAA Freshman of the Year until he suffered a severe ligament injury in his right big toe during the ninth game of the season. On March 17, the day before Duke played Hampton in the first round of the NCAA tournament, he returned for his first game since his injury. Duke advanced to the Sweet Sixteen of the NCAA Tournament but fell to Arizona. Irving scored 28 points in what turned out to be his last game for Duke. Irving announced that he would forgo his final three seasons of eligibility and enter the 2011 NBA draft, where he was selected with the first overall pick by the Cleveland Cavaliers. Irving was named to the 2012 Rising Stars Challenge, where he played for Team Chuck. Irving scored 34 points in the game, going 8-of-8 from three-point range, and earned MVP honors. He also won the 2012 NBA Rookie of the Year Award with 117 of a possible 120 first-place votes. He was the only unanimous selection to the NBA All-Rookie First Team. For the season, Irving averaged 18.5 points, 5.4 assists and shot 46.9% from the field, including 39.9% on three-pointers. At a Las Vegas Cavaliers practice on July 14, 2012, Irving sustained a broken right hand after reportedly slapping it against a padded wall after committing a turnover. "I am a little disappointed", he said. "I have to be more responsible about my health. It was just crazy. It happened so fast." It was announced that Irving would require hand surgery on July 18. At the start of the 2012–13 NBA season, Irving injured his index finger in a loss to the Dallas Mavericks. He played in the Cavaliers' next game, but the injury forced him to miss three weeks of action. In his second game back, while donning a black protective face mask to protect a broken bone he suffered against Milwaukee, Irving scored his then career-high 41 points against the New York Knicks. He became the youngest player in NBA history to score 40 points in Madison Square Garden; he was a year younger than Michael Jordan, who did it in 1985. The coaches selected Irving to play in his first All-Star game. He finished with 15 points, 4 assists, and 3 rebounds. He also participated in the Rising Stars Challenge again, scoring 32 points for Team Shaq in a losing effort. Irving participated in the NBA NBA Three-Point Shootout and recorded 23 points in the final round to win the event. Fans chose Irving to be the starting point guard for the Eastern Conference in the 2014 NBA All-Star game. He was the All-Star game MVP, recording 31 points and 14 assists as the East beat the West 163-155. On February 28, 2014, Irving recorded his first career triple-double with 21 points, 12 assists and 10 rebounds in a 99-79 win over the Utah Jazz. This was also the Cavaliers' first triple-double since March 16, 2010. On April 5, 2014, Irving recorded a then career-high 44 points in a 96–94 overtime loss to the Charlotte Bobcats. Irving averaged 20.8 points, 6.1 assists, 3.6 rebounds, and 1.5 steals on the season. On July 10, 2014, Irving signed a five-year, $90 million contract extension with the Cavaliers. His contract extension came in the wake of LeBron James's return to Cleveland and Kevin Love's trade request from Minnesota, as the trio teamed up to start a new "Big Three" in Cleveland. After a shaky start to the season, in which they fell to a record of 5-7 after a November 22 loss to Toronto, the Cavaliers went on an eight-game winning streak during which Irving averaged 19.3 points per game, including a 37-point game against the New York Knicks on December 4. After their streak-ending loss on December 11 to Oklahoma City, the Cavaliers went on to win just five more games in December, finishing 2014 at 18-14. All of the new Big Three missed time during December, contributing to team's inconsistency and mediocre play. The Cavaliers began their 2015 schedule on January 2 as they snapped a three-game losing streak with Irving's help. He scored 23 points, and with Love's 27, the Cavaliers defeated the Charlotte Hornets, 91-87. The Cavaliers' next game, against Dallas on January 4, was a season low for Irving, who scored just six points before leaving in the third quarter with lower back tightness; the Cavaliers lost, 90-109. Irving missed the next game, against Philadelphia, before returning to action on January 7 against Houston to tie a then first-half career high of 23 points. He finished the game with a then season-high 38 points, but could not lead the Cavaliers to a win as they lost 93-105, the team's seventh loss in nine games. After a six-game losing streak between January 4 and 13 dropped the Cavaliers to 19-20, Irving and James led them on a 12-game winning streak to bring them back into contention. During the streak, Irving averaged 24.5 points per game, including a then career-high 55 points on January 28 against Portland. His 11 three-pointers in that game set a Cavaliers franchise record while his 55 points were the second-most in Cavaliers history (behind James's 56) and the most scored in a home game, as well as the most points scored in Quicken Loans Arena history. His 28 first-half points also set a new career high for points in a half. On March 12, 2015, Irving scored a career-high 57 points, including a buzzer-beating three-point shot to send the Cavaliers into overtime, in a 128-125 win over the San Antonio Spurs. It was the most points for a player in a regular-season game against the defending champion since January 14, 1962, when Wilt Chamberlain scored 62 points for the Philadelphia Warriors in a loss to the Celtics. The effort also surpassed the Cavaliers' franchise single-game scoring mark of 56 points, set by LeBron James against the Toronto Raptors on March 3, 2005. Irving helped the Cavaliers win 34 of their final 43 games to finish the regular season as the No. 2 seed in the Eastern Conference with a 53-29 overall record. In his first career playoff game on April 19, Irving scored 30 points in a 113-100 win over the Boston Celtics in Game 1 of their first-round playoff matchup. He went on to help the Cavaliers reach the NBA Finals for just the second time in franchise history despite missing two games in the Eastern Conference Finals against the Atlanta Hawks with a knee injury. After leaving Game 1 of the NBA Finals against the Golden State Warriors in the overtime period with a knee injury, Irving was ruled out for the rest of the series the following day with a fractured left kneecap that required surgery, sidelining him for three to four months. The team lost the series to the Warriors in six games. On August 27, 2015, Irving was ruled unlikely to be ready for opening night of the 2015–16 season due to the left kneecap fracture he suffered in Game 1 of the 2015 NBA Finals. He made his season debut on December 20, scoring 12 points in 17 minutes as a starter against the Philadelphia 76ers. On January 6, he scored a season-high 32 points in a 121–115 win over the Washington Wizards. On February 8, he tied his season high of 32 points and tied his career high of 12 assists in a 120–100 win over the Sacramento Kings. Two days later, he topped his season high mark with 35 points in a 120–111 win over the Los Angeles Lakers. The Cavaliers finished the regular season as the first seed in the Eastern Conference with a 57–25 record. In the first round of the playoffs, the Cavaliers faced the eighth-seeded Detroit Pistons, and in a Game 1 win on April 17, Irving scored a playoff career-high 31 points. He tied that mark with another 31-point game in Game 4 of the series, helping the Cavaliers sweep the Pistons. The Cavaliers went on to breeze through the Eastern Conference playoffs with a 12–2 record to reach the 2016 NBA Finals, where they faced the Golden State Warriors for the second straight year. Irving struggled with his shot in his debut Finals game, going 7-of-22 from the field for 26 points, as the Cavaliers were defeated 104–89 in Game 1. Facing a 3–1 deficit following a Game 4 loss, Irving and LeBron James took over in Game 5, each scoring 41 points to lead the Cavaliers to a 112–97 win, forcing a Game 6. Irving and James became the first teammates to each score 40 points in an NBA Finals game. In Game 7, Irving hit a three-pointer with 53 seconds left in the game that propelled the Cavaliers to a 92–89 lead and an eventual 93–89 win. The Cavaliers won the series 4–3 and became the first team to rally from a 3–1 finals deficit, beating the defending champion Golden State Warriors to end a 52-year major sports championship drought in Cleveland. On October 25, 2016, after receiving his first championship ring prior to the season opener, Irving scored a game-high 29 points in a 117–88 win over the New York Knicks. Three days later, he scored 26 points and hit a go-ahead three-pointer with 44.3 seconds remaining to lift the Cavaliers to a 94–91 win over the Toronto Raptors. On November 27, he scored 19 of his then season-high 39 points in the fourth quarter of the Cavaliers' 112–108 win over the Philadelphia 76ers. On December 5, he had a career-high 10th straight game with at least 20 points, finishing with 24 points in a 116–112 win over the Toronto Raptors. On December 21, he had 31 points and a career-high 13 assists in a 113–102 win over the Milwaukee Bucks. On January 23, 2017, he scored 35 of his season-high 49 points in the second half of the Cavaliers' 124–122 loss to the New Orleans Pelicans—their fifth loss in seven games. On February 1, he set a new career high with 14 assists in a 125–97 win over the Minnesota Timberwolves. On March 3, he had a 43-point effort in a 135–130 win over the Atlanta Hawks. In the game, the Cavaliers set the NBA regular-season record with 25 three-pointers. On March 19, he had a 46-point effort in a 125–120 win over the Los Angeles Lakers. On April 9, he had a 45-point effort in a 126–125 overtime loss to Atlanta. In Game 4 of the Eastern Conference Finals against the Boston Celtics, Irving scored a playoff career-high 42 points to lead the Cavaliers to a 112–99 win, taking a 3–1 lead in the series. With 24 points in Game 5 of the series, he helped the Cavaliers defeat the Celtics 135–102 to claim their third straight Eastern Conference title and a return trip to the NBA Finals. After going down 3–0 in the 2017 NBA Finals, Irving scored 40 points in Game 4 to help Cleveland extend the series and avoid a sweep with a 137–116 win over the Golden State Warriors. The Cavaliers went on to lose to the Warriors in Game 5, thus losing the series 4–1. In July 2017, Irving requested the Cavaliers to trade him, reportedly to be more of the focal point of his own team instead of continuing to play alongside LeBron James. On August 22, he was traded to the Boston Celtics in exchange for Isaiah Thomas, Jae Crowder, Ante Žižić, and the rights to the Brooklyn Nets' 2018 first-round draft pick. Eight days later, the Celtics agreed to send the Cavaliers a 2020 second-round draft pick via the Miami Heat to complete the trade, as compensation for Thomas' failed physical. In his debut for the Celtics in their season opener against the Cavaliers on October 17, 2017, Irving had 22 points and 10 assists in a 102–99 loss. He had a chance to tie it with a 3-pointer at the horn but missed. On October 30, 2017, he scored 24 points for the third straight game in helping the Celtics defeat the San Antonio Spurs 108–94. It was the Celtics' first win over the Spurs since 2011. Irving's 128 points in his first six games as a Celtic were the most since Kevin Garnett and Ray Allen each had 131 in 2007. On November 6, 2017, he scored 35 points in a 110–107 win over the Atlanta Hawks, recording his first 30-point game as a Celtic while scoring more points (245) than any player in his first 11 games with Boston. With the win over Atlanta, the Celtics improved to 9–2 with nine straight wins, setting their longest winning streak in seven years. On November 20, 2017, he scored 10 of his season-high 47 points in overtime as the Celtics rallied from a double-digit deficit to beat the Dallas Mavericks 110–102, extending their winning streak to 16 games. The streak ended at 16 games with a loss to the Miami Heat two days later. On January 21, 2018, he scored 40 points in a 103–95 loss to the Orlando Magic. The Celtics had accumulated a 34–10 record by mid-January, but their loss to Orlando was their season-worst third straight defeat. On January 27, 2018, he scored 37 points on 13-for-18 shooting with five 3-pointers in a 109–105 loss to the Golden State Warriors. On February 28, 2018, Irving helped the Celtics improve to 4–0 following the All-Star break with a 134–106 win over the Charlotte Hornets. Irving led Boston with 34 points, making 13 of 18 shots overall and going 4-for-6 from 3-point range in the first three quarters. On March 24, 2018, he was ruled out for three to six weeks after undergoing a minimally-invasive procedure to remove a tension wire in his left knee. Less than two weeks later, he was ruled out for the entire postseason, with a recovery time of four to five months, after another procedure was scheduled to remove two screws from his patella that were inserted in 2015 to repair a fracture he suffered during that year's NBA Finals. In the Celtics' season opener on October 16, Irving played in his first game since March and had seven points and seven assists in a 105–87 win over the Philadelphia 76ers. He missed his first nine attempts from the field and did not score until finally connecting on a pair of free throws early in the third quarter. On October 30, after averaging 14 points through the first six games, Irving scored 31 points in a 108–105 win over the Detroit Pistons. On November 8, he scored 18 of his then season-high 39 points in the fourth quarter and overtime of the Celtics' 116–109 win over the Phoenix Suns. On November 16, he recorded a season-high 43 points and 11 assists in a 123–116 overtime win over the Toronto Raptors. It marked his first ever game scoring at least 40 points with 10 or more assists, and became the first Celtics player to do so since Antoine Walker in 2001. On December 12, he scored 38 points in a 130–125 overtime win over the Washington Wizards. On December 25, he recorded 40 points and 10 rebounds in a 121–114 overtime win over the 76ers. On December 29, he scored 22 of his 26 points in the second half of the Celtics' 112–103 win over the Memphis Grizzlies. His 13 assists matched his season best and was one short of his career high. On January 16, he recorded 27 points and a career-high 18 assists in a 117–108 win over the Raptors. On January 21, he had a career-high eight steals in a 107–99 win over the Miami Heat. On January 26, he recorded 32 points and 10 assists in a 115–111 loss to the Golden State Warriors. It was his 11th double-double with points and assists, becoming the first Celtic with 11 of that kind of double-double since Larry Bird in 1986–87. It was also Irving's sixth straight game with at least 25 points, matching the longest such streak in his career. In 2012, Irving was in contention for a position on the Australian team for the 2012 Olympics. However, he elected not to represent his nation of birth, instead focusing on selection for the United States national team for the 2016 Olympic Games. Irving was a member of the United States national team that competed in the 2014 FIBA Basketball World Cup. He helped lead Team USA to the gold medal and was subsequently named the tournament's MVP. He started all nine games in the tournament, averaging 12.1 points and 3.6 assists per game, including 26 points scored in the gold-medal game. He was then named the 2014 USA Basketball Male Athlete of the Year. In 2016, Irving helped Team USA win the gold medal at the 2016 Summer Olympics. With the win, he became just the fourth member of Team USA to capture the NBA championship and an Olympic gold medal in the same year, joining LeBron James, Michael Jordan, and Scottie Pippen. In 2012, Irving played the role of Uncle Drew in a series of Pepsi Max advertisements. He wrote and directed episode 2, in which he starred alongside Bill Russell and Kevin Love, and episode 3, in which he starred alongside Nate Robinson and Maya Moore. Irving also wrote and directed episode 4 of "Uncle Drew", which was released in November 2015, and in which he starred in alongside Baron Davis, J. B. Smoove, and Ray Allen. In 2017, the Uncle Drew advertisement series became a skit inside an old school diner featuring Pepsi in its current design, stored in a fridge with its original logo. Irving has also starred as the character in a feature film, Uncle Drew, which also features former NBA stars, and was released in June 2018. In 2012, Irving appeared on an episode of the Disney XD series Kickin' It. In June 2017, Irving starred in an episode of the Houzz series My Houzz, in which he surprised his father with a major home renovation. In 2018, Irving guest starred on Family Guy, lending his voice for the season 17 episode "Big Trouble in Little Quahog". Irving enjoys reading and has a journal. He also likes to sing, dance, and play the baritone sax. His godfather is former NBA player Rod Strickland. His cousin, Isaiah Briscoe, was a highly rated basketball player who played at the University of Kentucky before declaring for the 2017 NBA draft. Irving and his ex-girlfriend have a daughter together, Azurie Elizabeth Irving, who was born on November 23, 2015. Azurie's middle name, Elizabeth, was given to her in honor of Irving's late mother. In May 2011, Irving made a promise to his father to finish his bachelor's degree at Duke within five years. However, in 2016, having not achieved his degree, he claimed he was putting his plans on hold, stating, "when I leave the game of basketball, then I'll focus on the next step of my life". In 2015, he launched his PSD Underwear collection. In November 2016, Irving tweeted his support for the Standing Rock Sioux tribe protesters who were demonstrating against the Dakota Access Pipeline in North Dakota. Protesters say the pipeline violates sacred tribal land on Standing Rock Indian Reservation and poses a direct threat to clean water the tribe uses. In August 2018, Irving and his older sister were officially welcomed into the Standing Rock Sioux tribe. Irving's mother was a member of the tribe and lived on the reservation until her adoption at a young age. Their late grandmother and great-grandparents also have ties to the reservation. In February 2017, Irving stated in an interview for a podcast that he believes that the Earth is flat. In a later interview, he was less forceful in advancing his flat Earth belief, encouraging people to "do their own research" into the topic. In September 2017, Irving denied these claims and said that media misunderstood him as he was joking. However, in a June 2018 interview, when asked if he would admit that the world is round he said "I don't know. I really don't", and added that people should "do [their] own research for what [they] want to believe in" because "Our educational system is flawed." In October 2018, Irving apologized for his original flat Earth comments. Irving also stated that he believes in other conspiracy theories, such as the idea that John F. Kennedy was killed by the Federal Reserve, and that the CIA tried to kill Bob Marley. 2012 Kickin' It Himself Episode: "Sole Brothers"
2016 We Bare Bears Episode: "Charlie Ball"
↑ "Sharing talent on a big trip home". June 25, 2013. ↑ "For Kyrie and Dred Irving, a long, winding road took them to a magical draft night (and the Cleveland Cavaliers)". ↑ "Teague family at heart of hoops' little-man revolution". Sports Illustrated. Lee Jenkins. Retrieved December 31, 2015. 1 2 "Kyrie Irving Bio – Duke University". Duke Sports Information. May 16, 2011. Retrieved March 12, 2013. 1 2 "Kyrie Irving is Committed to the Red, White and Blue". usabasketball.com. June 21, 2010. Archived from the original on August 24, 2010. 1 2 3 4 Spears, Marc J. (June 17, 2011). "Irving rewards father's perseverance". Yahoo.com. Retrieved October 8, 2017. ↑ Neumann, Thomas (June 21, 2016). "Ben Simmons follows footsteps of these Aussies, Kiwis in NBA". ESPN.com. Retrieved October 8, 2017. Irving holds dual American and Australian citizenship but has lived in the United States since age 2. ↑ Nichols, Rachel (January 11, 2017). "Rachel Nichols Sit down Interview with Kyrie Irving". ESPN. ↑ Windhorst, Brian (August 22, 2018). "Kyrie Irving finds new name and new family on North Dakota reservation". ESPN.com. Retrieved September 5, 2018. ↑ Appleman, Jake (February 29, 2012). "Cavs' Irving, a No. 1 Pick, Is Exceeding Expectations". NYTimes.com. Retrieved March 12, 2013. ↑ Gary Washburn. "Kyrie Irving's winner makes dad proud". The Boston Globe. Retrieved May 22, 2017. 1 2 3 4 Boyer, Mary (May 31, 2011). "Kyrie Irving wants to remain normal, but Cleveland Cavaliers' potential No. 1 pick is anything but, say coaches, teammates". The Plain Dealer. Retrieved March 12, 2013. 1 2 3 4 5 "2010 USA Junior National Select Team Media Guide" (PDF). USA Basketball. April 7, 2010. Archived from the original (PDF) on September 15, 2012. Retrieved March 13, 2013. ↑ "2011 Prospect Rating – Top 150". Rivals.com. November 11, 2011. Retrieved March 13, 2013. ↑ "College Basketball Team Recruiting Prospects". Scout.com. 2011. Retrieved March 13, 2013. ↑ Huff, Doug (February 22, 2010). "St. Patrick banned from state tourney". ESPNRise.com. Retrieved March 16, 2013. ↑ Ceglinsky, Sean (January 20, 2010). "It's the USA Against Everyone Else". Slam Online. Retrieved March 13, 2013. ↑ "Kyrie Irving Selected For McDonald's All-American Game". Duke Sports Information. February 12, 2010. Retrieved March 14, 2013. ↑ "Harrison Barnes And Kyrie Irving Named Co-MVPs Of The 2010 Jordan Brand Classic". TheStreet.com. April 18, 2010. Retrieved March 12, 2013. ↑ "Irving & Hairston Win Gold With USA U18 Team". USA Basketball. July 1, 2010. Retrieved March 14, 2013. ↑ Riggs, Randy. "Irving picks Duke over Aggies, Kentucky". Archived from the original on May 13, 2014. Retrieved August 6, 2012. ↑ "Duke guard Kyrie Irving out indefinitely with toe injury". usatoday.com. Associated Press. December 9, 2010. Retrieved August 6, 2012. ↑ Kirk, Jason. "Kyrie Irving Could Return To Play In NCAA Tournament First Round Vs. Hampton". sbnation.com. Retrieved August 6, 2012. ↑ Hall, Tim. "Irving says toe feels good, could play in NCAA". wralsportsfan.com. Retrieved August 6, 2012. ↑ "Derrick Williams, Arizona crush Duke's hopes to repeat as champions". ESPN. Associated Press. Retrieved August 6, 2012. ↑ "Cleveland Cavaliers select Kyrie Irving as first overall pick in NBA draft". Guardian. London. June 24, 2005. Retrieved June 24, 2011. ↑ Hoffman, Benjamin (June 23, 2011). "In Draft Considered Low Impact, Cavaliers Choose Duke's Irving First". New York Times. Retrieved June 24, 2011. ↑ Irving steals Rising Stars Challenge as Lin goes silent. Usatoday.com (February 24, 2012). Retrieved on 2012-05-05. ↑ Boyer, Mary Schmitt (May 15, 2012). "Early failure set path to Rookie of the Year success for Cleveland Cavaliers' Kyrie Irving". The Plain Dealer. Retrieved May 16, 2012. ↑ "Irving, Rubio headline 2011–12 NBA All-Rookie First Team". Archived from the original on May 25, 2012. Retrieved May 23, 2012. ↑ "Cavaliers' Kyrie Irving named Kia Rookie of the Year" (Press release). NBA. May 15, 2012. Archived from the original on May 15, 2012. 1 2 "Cavaliers' Irving breaks right hand after slapped padding on wall". SportsIllustrated.CNN.com. AP. July 14, 2012. Retrieved July 15, 2012. ↑ Boyer, Mary Schmitt (July 14, 2012). "Cleveland Cavaliers' Kyrie Irving fractures hand in summer league workout". The Plain Dealer. Cleveland.com. Retrieved July 15, 2012. ↑ "Cleveland Cavaliers' Kyrie Irving to have hand surgery Wednesday – ESPN". Espn.go.com. July 16, 2012. Retrieved February 8, 2013. ↑ ESPN.com Retrieved November 19, 2012. ↑ "Kyrie Irving drops career-high 41, but Cavs fall to Knicks." ESPN.com Retrieved December 16, 2012. ↑ basketballreference.com, 2013 NBA All-Star Game Box Score, accessed July 22, 2013. ↑ "Team Shaq at Team Chuck". ↑ nba.com Irving wins Foot Locker Three-Point Contest, accessed July 22, 2013. ↑ espn.com, Kyrie Irving Stats, accessed July 22, 2013. ↑ release, Official. "Curry starts in first All-Star Game; LeBron top vote-getter". ↑ NBA (April 5, 2014). "Kyrie Irving Scores a Career-High 44 Points!" – via YouTube. ↑ "Cavaliers and Kyrie Irving Sign Contract Extension". ↑ "Cavs owner on Irving deal: Big piece of plan". 1 2 "Kyrie Irving 2014-15 Game Log - Basketball-Reference.com". ↑ "Cavs' Irving (back) out Monday vs. Sixers". ↑ "Trail Blazers at Cavaliers". ↑ "Kyrie Irving drops a career-high 57 points to lead Cavaliers over Spurs in overtime". ↑ "Kyrie Irving scores 57 in leading Cavs to OT win over Spurs". ESPN. March 12, 2015. Retrieved March 13, 2015. ↑ "Cleveland Cavaliers open postseason as odds on favorite to win the Eastern Conference, Las Vegas says". ↑ "Kyrie Irving on playing alongside LeBron James: 'I became a fan'". ↑ "Cavaliers Status Update – Kyrie Irving – June 5, 2015". NBA.com. June 5, 2015. Retrieved June 6, 2015. ↑ "Cavs' Kyrie Irving Suffers Kneecap Fracture, Out For Finals". BallerStatus.com. June 5, 2015. Retrieved June 6, 2015. ↑ "Kyrie Irving, Cleveland Cavaliers will not rush his return from knee injury; he may not play until January, sources say". ↑ "Knicks vs. Cavaliers - Game Recap - October 25, 2016 - ESPN". ↑ "Cavaliers vs. Raptors - Game Recap - October 28, 2016 - ESPN". ↑ "Cavaliers vs. 76ers - Game Recap - November 27, 2016 - ESPN". ↑ "Cavaliers vs. Raptors - Game Recap - December 5, 2016 - ESPN". ↑ "Bucks vs. Cavaliers - Game Recap - December 21, 2016 - ESPN". ↑ "Cavaliers vs. Pelicans - Game Recap - January 23, 2017 - ESPN". ↑ "Timberwolves vs. Cavaliers - Game Recap - February 1, 2017 - ESPN". ↑ "Cavaliers vs. Hawks - Game Recap - March 3, 2017 - ESPN". ↑ "Cavaliers vs. Lakers - Game Recap - March 19, 2017 - ESPN". ↑ "Hawks cap 26-point rally vs. Cavaliers with stunning OT win". ESPN.com. April 9, 2017. Retrieved April 9, 2017. ↑ "Kyrie Irving scores career playoff high 42 points to lead Cavs over Celtics". ESPN.com. May 23, 2017. Retrieved May 24, 2017. ↑ "James passes Jordan, Cavs back in Finals with 135-102 win". ESPN.com. May 25, 2017. Retrieved May 25, 2017. ↑ "LeBron, Cavs end Warriors' perfect postseason run in Game 4". ESPN.com. June 9, 2017. Retrieved June 10, 2017. ↑ Windhorst, Brian (July 21, 2017). "Kyrie Irving requesting trade out of Cleveland to find bigger role". ABC News. Retrieved August 28, 2017. ↑ "Irving's trade demand conveys latest disconnect in Cleveland". ESPN.com. July 22, 2017. Retrieved July 26, 2017. ↑ "Celtics Acquire Four-Time All-Star Kyrie Irving". NBA.com. August 22, 2017. Retrieved August 22, 2017. ↑ Wojnarowski, Adrian (August 30, 2017). "Cavs add 2nd-round pick from Celtics to complete Kyrie Irving-Isaiah Thomas trade". ESPN.com. Retrieved August 30, 2017. ↑ "Hayward breaks ankle, Cavs hold off Celtics 102-99 in opener". ESPN.com. October 17, 2017. Retrieved October 17, 2017. ↑ "Celtics beat Spurs 108-94". ESPN.com. October 30, 2017. Retrieved October 30, 2017. 1 2 "Irving, Celtics hold off Hawks in closing minutes". ESPN.com. November 6, 2017. Retrieved November 6, 2017. ↑ "Irving's 47 lead Celtics past Mavericks to maintain streak". ESPN.com. November 20, 2017. Retrieved November 20, 2017. ↑ "Heat top Celtics 104-98, snap Boston's 16-game win streak". ESPN.com. November 22, 2017. Retrieved November 22, 2017. ↑ "Magic win for 3rd time in 20 games, beat Celtics 103-95". ESPN.com. January 21, 2018. Retrieved January 21, 2018. ↑ "Curry scores 13 points over final 1:42, Warriors beat Boston". ESPN.com. January 27, 2018. Retrieved January 28, 2018. ↑ "Irving scores 34 for Boston in 134-106 win over Hornets". ESPN.com. February 28, 2018. Retrieved February 28, 2018. ↑ "Kyrie Irving Injury Update". NBA.com. March 24, 2018. Retrieved March 24, 2018. ↑ "Kyrie Irving Injury Update". NBA.com. April 5, 2018. Retrieved April 5, 2018. ↑ Wojnarowski, Adrian (April 5, 2018). "Kyrie Irving won't return this season, including playoffs". ESPN.com. Retrieved April 5, 2018. ↑ "Celtics beat 76ers 105-87 as Hayward, Irving make returns". ESPN.com. October 16, 2018. Retrieved October 16, 2018. ↑ "Irving scores 31, Celtics beat Pistons again 108-105". ESPN.com. October 30, 2018. Retrieved October 30, 2018. ↑ "Irving, Celtics rally from 22 down to top Suns 116-109 in OT". ESPN.com. November 8, 2018. Retrieved November 8, 2018. ↑ "Kyrie scores 43, Celtics beat Raptors 123-116 in OT". ESPN.com. November 16, 2018. Retrieved November 16, 2018. ↑ "Irving scores Boston's last 12 in 130-125 OT win at Wizards". ESPN.com. December 12, 2018. Retrieved December 12, 2018. ↑ "Irving scores 40, leads Celtics to 121-114 win over Sixers". ESPN.com. December 25, 2018. Retrieved December 26, 2018. ↑ "Irving, Horford lead rally as Celtics beat Grizzlies 112-103". ESPN.com. December 29, 2018. Retrieved December 30, 2018. ↑ "Irving's 27 points, 18 assists leads Celtics past Raptors". ESPN.com. January 16, 2019. Retrieved January 17, 2019. ↑ Hass, Trevor (January 21, 2019). "Kyrie Irving registered a career-high 8 steals against the Miami Heat". Boston.com. Retrieved January 22, 2019. ↑ "Warriors win 10th straight, beat Celtics 115-111". ESPN.com. January 26, 2019. Retrieved January 27, 2019. ↑ "NBA rookie-of-the-year candidate Kyrie Irving opts not to represent Australia at London Olympics". Fox Sports (Australia). March 6, 2012. Retrieved June 14, 2016. ↑ "Kyrie Irving lauded by Team USA". ESPN. December 21, 2014. Archived from the original on December 22, 2014. ↑ "Kyrie Irving helps Team USA win gold medal at 2016 Olympics, joins elite company". 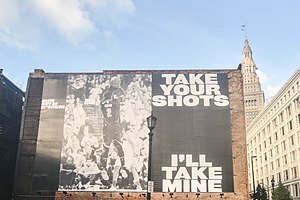 ↑ "Kyrie Irving's Iconic Game 7 Shot Has Been Immortalized In Cleveland". October 24, 2016. ↑ "Kyrie Irving Reveals 'Uncle Drew' Inspiration". Bleacher Report. Retrieved January 15, 2013. ↑ "Love Appears In Successful "Uncle Drew" Series". NBA. Retrieved January 15, 2013. ↑ Thornburgh, Tristan. "Pepsi Max and Kyrie Irving Present Uncle Drew Chapter 3". ↑ Pepsi (November 12, 2015). "Uncle Drew - Chapter 4 - Pepsi" – via YouTube. ↑ Gould, Andrew. "Kyrie Irving Reveals June 29 Release Date for 'Uncle Drew' Movie". Bleacher Report. Retrieved February 14, 2018. ↑ "Irving on Disney show, return of his 'uncle'". ↑ Stein, Megan. "Try Not to Cry After Seeing Cavaliers All-Star Kyrie Irving Surprise His Father with a Home Renovation: 'He Really Was Super Dad'". People.com. Retrieved June 14, 2017. ↑ Yang, Nicole (October 22, 2018). "Kyrie Irving got a credit in the most recent episode of 'Family Guy'". Boston.com. Retrieved December 19, 2018. ↑ Jordan, Jason (April 1, 2015). "Isaiah Briscoe's on-court cockiness helps him consistently dominate". USA Today. Retrieved June 23, 2015. ↑ Fedor, Chris (November 24, 2015). "Kyrie Irving announces birth of his daughter, says 'she came into the world to bring a shine to my world'". Cleveland.com. Retrieved September 29, 2016. ↑ Leung, Diamond (May 19, 2011). "Kyrie Irving plans on degree in five years". ESPN. Retrieved August 21, 2014. ↑ "How Kyrie Irving And Other Athletes Made PSD Underwear A Hot Brand". Forbes. October 2, 2015. Retrieved June 27, 2017. ↑ Waldron, Travis (November 23, 2016). "Kyrie Irving Tweets Support For Standing Rock Sioux Protesters". huffingtonpost.com.au. Retrieved November 3, 2017. ↑ Nicholson, Blake (August 23, 2018). "Kyrie Irving, sister officially welcomed into mother's Sioux tribe". NBA.com. Associated Press. Retrieved October 2, 2018. ↑ Nicholson, Blake (August 27, 2018). "Why Kyrie Irving's Connection to the Standing Rock Sioux Matters". TheNation.com. Retrieved October 2, 2018. ↑ Woo, Jeremy (October 12, 2017). "Kyrie Irving has Apparently Gone to a Plant-Based Diet". Sports Illustrated. Time Inc. Retrieved December 27, 2017. ...but it appears Kyrie has gone to a plant-based diet. ↑ Beltrone, Gabriel (December 27, 2017). "From Vegan Diet to Flat Earth, Kyrie Irving's Insane New Nike Ad Packs In a Lot". Adweek. Retrieved December 27, 2017. ...while the Nike team also manages to work in a plug for Irving's vegan diet. ↑ Ruff, Rivea (February 17, 2017). "Kyrie Irving Actually Believes Earth is Flat". Bleacher Report. Turner Broadcasting System. Retrieved February 18, 2017. ↑ Matyszczyk, Chris (February 18, 2017). "NBA star Kyrie Irving believes Earth is flat". CNET. CBS Interactive. Retrieved February 18, 2017. ↑ Bean, DJ (September 25, 2017). "Kyrie Irving tells T&R he was trolling with flat earth stuff". CSNNE.com. Retrieved September 26, 2017. ↑ "Kyrie Irving apologizes for saying Earth is flat: 'Didn't realize the effect'". ESPN. Retrieved October 2, 2018. ↑ Shamus, Gregory (August 23, 2017). "This is what Kyrie Irving said about the earth being flat". The Boston Globe. Retrieved September 7, 2017. ↑ "Irving on Disney show, return of his 'uncle'". espn.com. October 22, 2012. Retrieved June 28, 2018. ↑ "VIDEO: Damian Lillard, Kyrie Irving And Paul George To Appear On 'We Bare Bears' Cartoon". nba.com. February 6, 2016. Retrieved June 30, 2018. Wikimedia Commons has media related to Kyrie Irving.